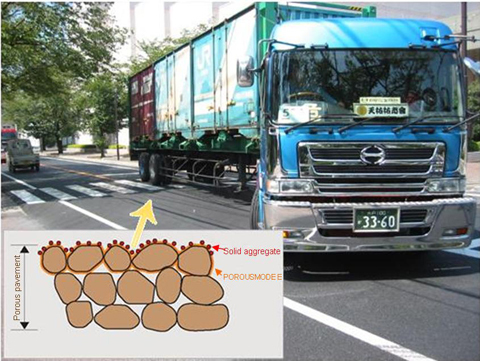 The POROUS MODE E construction method is a surface strengthening (top coat) construction method for porous asphalt paving that inhibits aggregate scattering. POROUS MODE E is a two-stage hardening type reactive emulsion which has less odor than the previous resin-based materials, and is a material that is gentle to the environment. The aggregate scattering resistance is high, and it has outstanding durability. 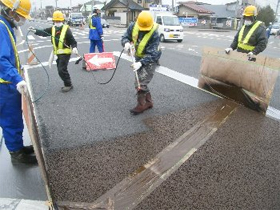 Because the main constituent is asphalt emulsion, there is no odor such as that of the previous resin products, and the construction method will be gentle to the environment. Implementation is possible even when the road surface is wet or when the road surface temperature is high.